A visit to the Fortress of Louisbourg, set on the northeastern coastline of Cape Breton island, is like taking a step back in time. 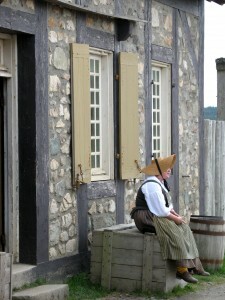 This is one Nova Scotian destination you absolutely must put on your itinerary and you should block off a whole day to wander through the streets of what is North America’s largest reconstructed 18th-century French fortified town. At its peak, Louisbourg was a key part of France’s battle with Britain for control of the New World. The British eventually prevailed, destroying Louisbourg’s fortifications in 1760, although a healthy cod fishery ensured the community survived. The fortress lay neglected until reconstruction began in the 1960s. Today it’s an amazing insight into what life was like in the summer of 1744. Step inside the busy waterfront tavern, talk with the soldiers, listen to the boom of the cannons and see how all manner of people lived nearly 300 years ago. From the richest to the poorest, you’ll encounter dozens of interpreters in costume, ready to tell you about everything from drying fish for the winter to the music of the time. Among the highlights are two homes. One, belonging to the King’s engineer Étienne Verrier, is where you can examine the layout and plans for Louisbourg, while in the other belonging to Captain and Madame DeGannes you can learn the secrets of lace making and cooking. When you’ve had your fill of walking, relax over an authentic 18th century meal in one of the 3 period restaurants, exactly where the town residents and off-duty soldiers would have spent their leisure time hundreds of years ago. True to the times, you’ll only have a large spoon to eat with! During peak season, try to get to the restaurants early, before the crowds set in. There’s also an exhibit on Louisbourg’s reconstruction during the 1960s and 1970s and if you walk to the far reaches of the fortress, you can see what is being uncovered in current excavations. Before you leave, pop by the bakery to buy a loaf of bread, equivalent to one soldier’s daily ration. Directions: From the Canso Causeway, either take Highway 104 or Highway 125 to Sydney, then Route 22 towards Louisbourg. The fortress is just past the town of Louisbourg and is well signed. Allow 2-3 hours driving time from the Canso Causeway or 30 minutes from Sydney. Opening Hours:May 16 to June 30, 9:30am to 5 pm; July 1 to August 31, 9am to 5:30pm; September 1 to October 15, 9:30am to 5pm; No animation or services from May 16-31 and October 16-31 and only limited access to reconstructed Site. Closed from November 1 to May 15.